You know those people who always have amazing hair and never have to do anything to it? Yeah… that’s definitely not me. I have always been a hair product junkie. I love trying new hair products but not only because it’s fun. I’m always looking for the next best thing, because my hair is not amazing on its own. I just don’t have that kind of ‘wash and go’ hair. I am so lucky to be part of a generation of women who go against the status quo and share their beauty experiences online. 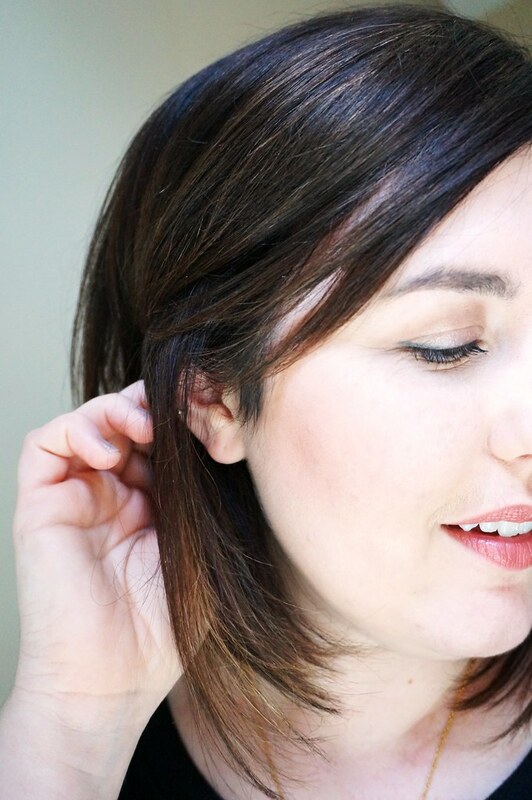 Today, I’ll be sharing my newest holy grail hair products! I was sent an amazing collection of products from TRESemmé. I’ve literally turned my hair routine on its head, and I couldn’t be happier with the result. I’ll back up just a bit and tell you my hair concerns first. I have fine, wavy hair that turns flat and frizzy as the day goes on. I really have to work to get volume. My hair is also dry, but conditioner weighs it down very easily. My hair needs moisture from root to tip, but if I put conditioner all over my hair goes completely flat. It’s a hard balance to get the right amount of moisture and the right amount of volume. I was sent the TRESemmé Beauty-Full Volume collection to try out, and I couldn’t be happier with it. This system focuses on moisturizing your hair first and then adding volume. My hair has been smoother, less frizzy, and very voluminous. My hair has actually been bouncy all day long! I have been so happy with the results. 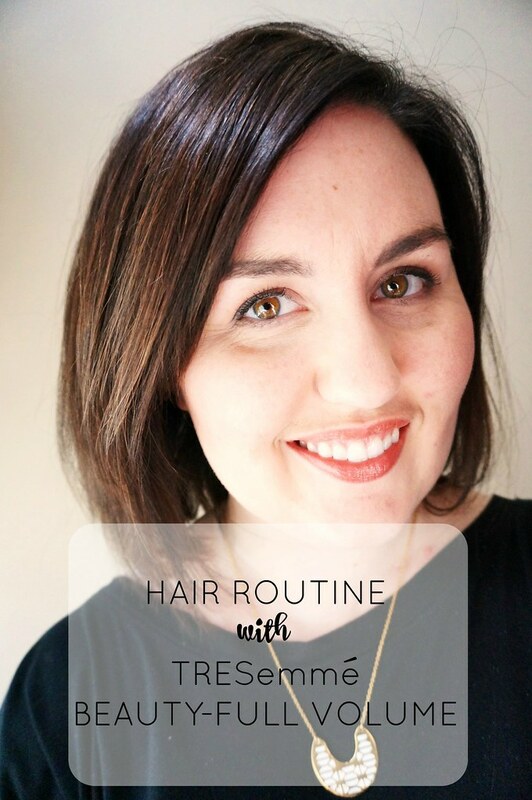 First, I wet my hair and apply four pumps of the TRESemmé Beauty-Full Volume Pre-Wash Conditioner. This reinforces the hair’s naturally protective layer. I let it sit for one minute and then rinse it out. 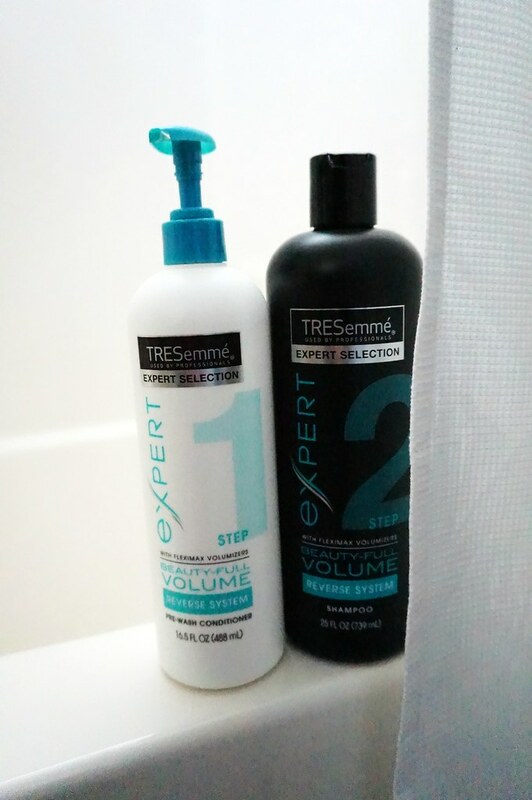 Second, I wash my hair with the TRESemmé Beauty-Full Volume Shampoo. This leaves an ultra-light conditioning layer on the hair. I love how sudsy this shampoo gets, and the small is amazing! One of my boys said my hair smelled like the beach. I’ll take that as a compliment! 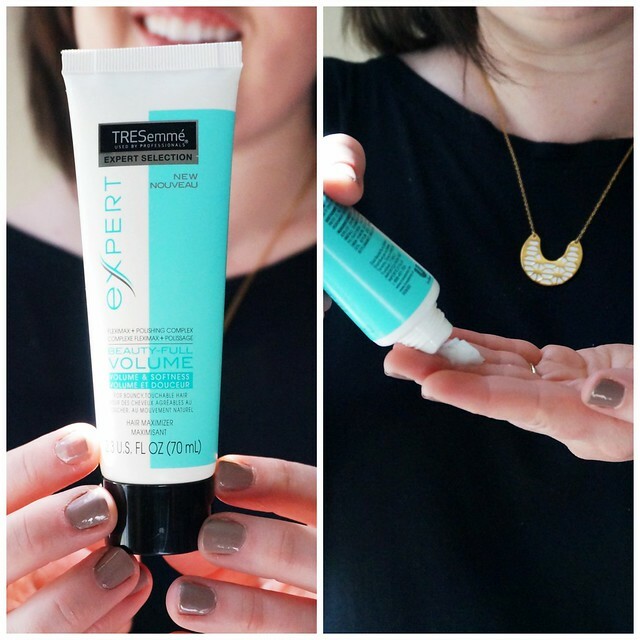 I towel dry my hair and then apply the TRESemmé Hair Maximizer from root to tip. This is actually a huge deal to me, because I’ve never been able to apply a styling product from root to tip. They’ve always weighed down my hair. This one actually moisturizes my hair without any weight. It provides my hair with bounce, smoothness, and manageability. 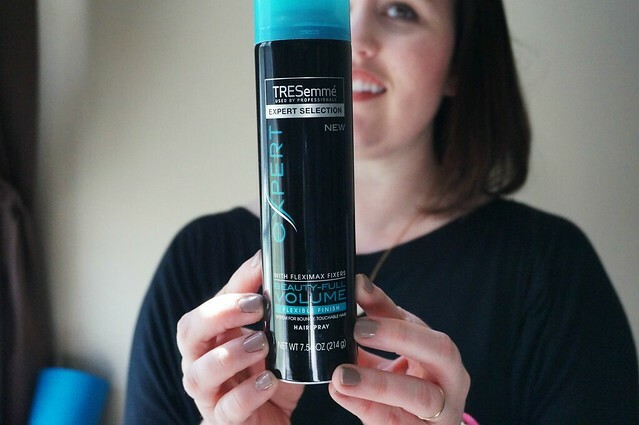 Before I blow dry my hair, I apply the TRESemmé Beauty-Full Volume Touchable Bounce Mousse. I concentrate it at my roots and then come it through to the tips of my hair. Next, I blow dry with a round brush. This gives me maximum volume and control over the direction of my bangs. After I blow dry, I run my flat iron through the ends of my hair. The rest of my hair does not need any straightening. I do run the flat iron through my bangs, because they want to go in their own directions. This new hair routine has actually cut out some styling time for me. Before, I would have to spend at least 5-10 minutes straightening my hair. Now, I spend 2 minutes, tops. 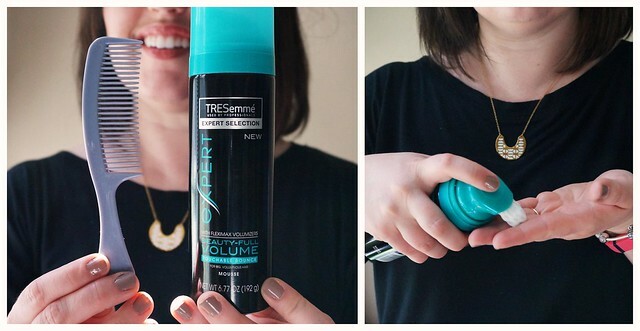 Last, I give my hair a quick spray of the TRESemmé Beauty-Full Volume Flexible Finish Spray. 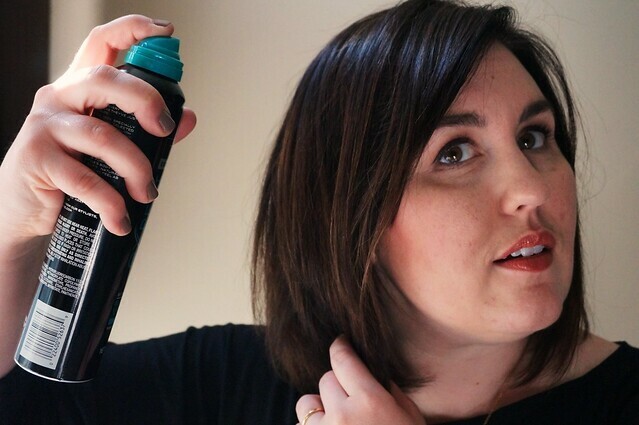 I am a huge fan of flexible hair sprays, because they give your hair hold without leaving it crunchy. This hair spray is very effective. I don’t need a lot to give my hair hold, so I foresee this last me a long time. I can’t rave enough about this hair care system! It has genuinely changed the way I feel about my hair. I am so glad that I don’t have to choose between moisture and volume. With the TRESemmé Beauty-Full Volume collection, I really can have my cake and eat it, too. Do you have issues with your hair being frizzy and flat? Try it and let me know how much you love the TRESemmé Beauty-Full Volume collection!